Guinness is the latest brand to bolster its teetotal drinks offering after launching a new non-alcoholic beer it claims doesn’t compromise on flavour. The Diageo-owned brewer has produced a “full flavoured, non-alcoholic lager” at Guinness’ experimental St. James’s Gate site. The beer’s launch comes as retailers, bars and drinks makers are attempting to weather the worldwide decline of alcohol consumption by bolstering and improving their teetotal and low ABV offerings. The rate of decline in global alcohol consumption is accelerating, according a 2017 report from market researcher IWSR, with the global market for alcoholic drinks shrinking by 1.3% in 2016, compared with an average rate of 0.3% in the previous five years. As drinking habits change, companies both in the on and off-trade sectors have worked to improve their non-alcoholic and low ABV products.. In November 2017 Tesco launched a new low-alcohol wine range to keep up with the public’s taste for lighter drinks, while in August challenger retailer Aldi added four more low ABV wines to its own-label range. Guinness introduced its first non-alcoholic beer, Guinness Zero, in Indonesia in 2014 to tap into a new market of sober drinkers. The new lager, which launched this week, stands “shoulder to shoulder” with its usual beer range, according to a promotional video Guinness posted on Youtube on 17 January. “Whether you’re seeking alcohol or not, we think great-tasting beer is the goal,” said Guinness’ lead brewer John Casey told the Irish Times. 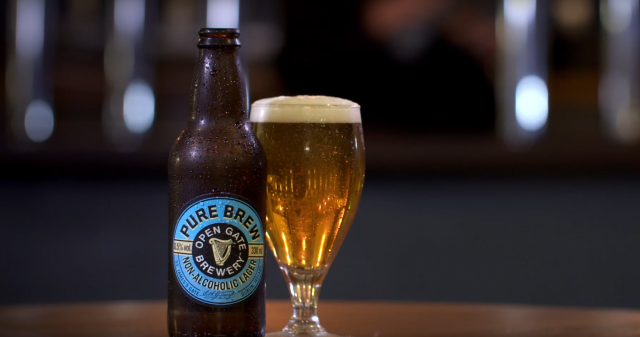 Open Gate Pure Brew, available in 330ml bottles, will be initially rolled out to 250 pubs in Dublin from January 2018, before it is distributed throughout the rest of the nation in March. “Many non-alcoholic beers are made by taking a conventional beer and boiling away the alcohol which can impact the taste,” Casey said. Mark Sandys, global head of beer at Diageo said: “Consumers shouldn’t have to compromise on taste on occasions when choosing not to drink or to moderate their alcohol intake, so we are excited to be offering more choice with our latest innovation from the Open Gate Brewery. Drinks giant Diaego stepped up its investment in the teetotal drinks market in 2016, when it took a minority stake in non-alcoholic spirits brand Seedlip. In June 2017 Diageo announced it was establishing a new business development programme for non-alcoholic drinks, that will see it invest around £10,000 each ($12,000) in four non-alcoholic companies. Had several Pure Brews in Ireland in September, 2018. Enjoyed it very much. I agree that it has a great taste. When will it be available in the States? This is the best non-alcoholic beer out there. Along with Nanny State Craft. How can I buy a case from Canada?